The Unheard Story Of India’s First Shopping Mall. 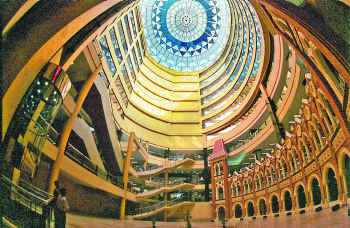 Spencer Plaza, is said to be one of the biggest shopping malls in South Asia, is located in modern Chennai. The Story of establishment of India’s First shopping mall goes back to British Raj. In the year 1863-64, the first Departmental store in the Indian subcontinent was established by Charles Durant and J.W. Spencer. The store had over 80 individual departments. After a few years, Eugene Oakshott, owner of Spencer’s, shifted the department store to a new building designed by W. N. Pogson. New building, which was an example of Indo-Saracenic style of architecture. In 1983, the original building was destroyed in a fire. The new building of Spencer Plaza was constructed on the same site measuring about 10 acres and was opened in 1991. Today, Spencer is considered as 11th biggest mall in India.